The Early Middle Ages of Western Europe, from AD 400 to 1000, was a boiling cauldron which bubbled over and impacted every corner of the world. Organized both by chronology and by geography, this lively book, with its tongue firmly planted in its cheek, dives fearlessly into that confused and confusing period, tracing the history of each century, beginning in North Africa and then proceeding around the Mediterranean Sea to Spain, Britain, France,Germany and the Low Countries, ending in Italy. This whole period is usually considered to be the by-product of Rome's decline; most Europeans and many North Africans were still calling themselves Romans while obliterating the Roman legacy on their turbulent journey toward the High Middle Ages and the Renaissance. This book, ironic though it may be, is meticulously researched, including extensive notes and quotes from contemporaries. Chronicling the idiocies and occasional heroism of the energetic and star-crossed people who had the misfortune to live in these fractious eras and heralding the survival skills of those who actually made it through, The Lighter Side of the Dark Ages is an illuminating journey througha fascinating period of history. 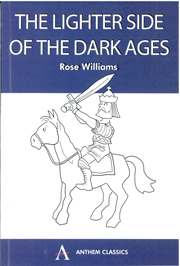 In her book: The Lighter Side of the Dark Ages, Rose Williams expertly combines both serious scholarship and humor to talk about a subject that seems to be the domain more of the former than the latter. First, the book is a scholarly achievement because in each chapter she takes a different century (between the fifth and the tenth) and successfully deals with a web of complicated events going on in different parts of Europe during that century. What also gives the book a scholarly touch are the quotes that head each section of every chapter. Some of the quotes are directly related to the Dark Ages like St. Jerome's comment that heads the overview: "Romanus orbs ruit et tamen cervix nostra erecta non flectitur" which Rose translates as "The Roman world is collapsing and yet we do not bend our haughty necks." Or they can be from classical sources reflecting on the human condition relevant to any age like Phaedrus' quote that heads the section on Britain from the third chapter: "humiles laborant ubi potentes dissident" which is translated as "the lowly suffer when the powerful disagree." The bibliography gives testimony to the wide range of subjects Rose takes on including such titles as Antique Cities of Tunisia and The Stirrup and its Origins along with books dealing specifically with medieval Europe. Finally there is also a special section on the ancient sources that were quoted throughout. Yet the humor always accompanies serious research in this book adding yet another dimension to it. In the introduction, Rose Williams argues that something good must have happened in the 500 years that the Dark Ages lasted or else: "Europe would have reverted to the wolves and bears (which, we must admit, some of the principal people of the era resembled in attitude and fragrance)." However, it is here that one must stress that the humor adds to the book and never usurps or trivializes it. To conclude, I find The Lighter Side of the Dark Ages a much needed book that not only appeals to a wide readership but also sheds some light on a very dark subject.